First edition of this anthology (selection copyrighted 1976 to Frederik Pohl), apparent first printing. "Printed in Germany 1976" stated on copyright page. States mistakenly the ISBN 3-453-30386-5 on copyright page, which was previously assigned to Die Armada von Scorpio by Alan Burt Akers (Kenneth Bulmer). 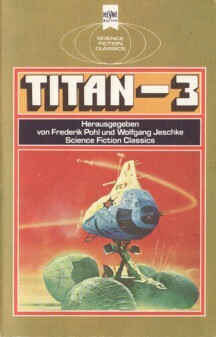 It's 'Titan-3' on the cover, but 'Titan 3' on spine and title page. Translations by Yoma Cap and Walter Brumm. No cover artist stated (only a credit for Futura Publications), but same cover as Galactic Alarm . Cover design ("Umschlaggestaltung") credited to Atelier Heinrichs on copyright page. Month deducted from publishing schedule of Heyne in 1976 (four books per month).